CarPlay, Apple's forthcoming vehicle infotainment center standard, will feature support for Major League Baseball's At Bat application for iPhone at launch, along with other radio services like iHeart Radio, Beats, Spotify, and Stitcher. Support for MLB.com At Bat is now listed on Apple's official CarPlay website. In addition to the aforementioned iPhone apps, Apple's "Podcasts" app is also compatible. 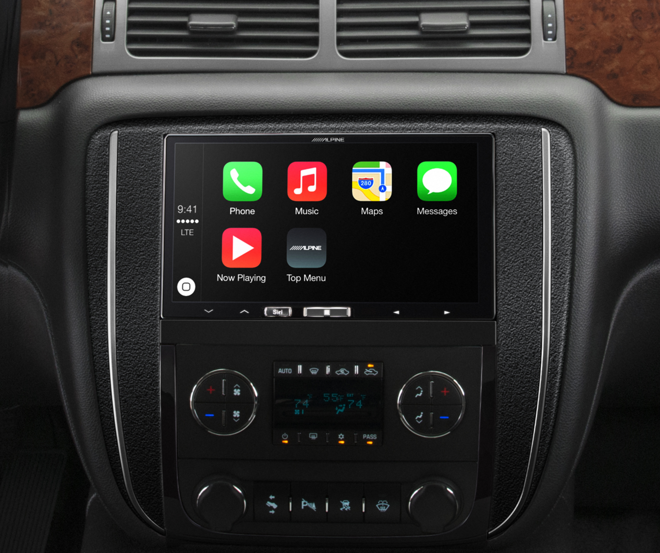 The site also lists Alpine and Pioneer as companies that are set to launch aftermarket CarPlay units for older cars. Pioneer will add CarPlay support through updates to its current lineup of NEX infotainment systems, while Alpine will launch entirely new products. CarPlay will also appear in preinstalled units on select 2014 vehicles from Honda, Hyundai, Mercedes-Benz, Volvo, and Ferrari. Future support has been pledged from a number of major automakers, including Ford, Toyota, Chevrolet, BMW, Kia, Mitsubishi, Nissan, Subaru, and Land Rover. In addition to support for select third-party apps, CarPlay will also come with built-in compatibility with Apple's native Phone, Music, Maps, and Messages applications. A "Now Playing" application will also be a part of the default installation.